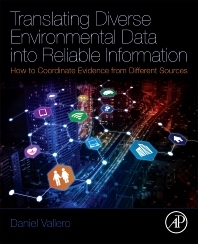 Translating Diverse Environmental Data into Reliable Information: How to Coordinate Evidence from Different Sources is a resource for building environmental knowledge, particularly in the era of Big Data. Environmental scientists, engineers, educators and students will find it essential to determine data needs, assess their quality, and efficiently manage their findings. Decision makers can explore new open access databases and tools, especially portals and dashboards. The book demonstrates how environmental knowledgebases are and can be built to meet the needs of modern students and professionals. Topics covered include concepts and principles that underpin air, water, and other public health and ecological topics. Integrated and systems perspectives are woven throughout, with clues on how to build and apply interdisciplinary data, which can increasingly be obtained from sources ranging from peer-reviewed research appearing in scientific journals to information gathered by citizen scientists. This opens the door to using vast amounts of open data and the necessary quality assurance and metadata considerations for their countless applications.